As we have previously reported, on July 29, Richard Griffin, General Counsel of the National Labor Relations Board, announced his intention to charge McDonald's USA, LLC, as a "joint employer" with its franchisees in a series of unfair labor practice charges arising from employee protests. This move, along with the General Counsel's position in a pending case that Browning-Ferris Industries is a joint employer with its temporary employee provider, signals the GC's desire to reverse 30 years of established Board precedent concerning the legal standard for "joint employer" status. As a result, business models based on franchised operations, use of temporary employees, outsourcing of operations, and similar separations of the employer-employee relationship are all likely to be affected. BFI operates a recycling business and uses approximately 300 employees, only 60 of whom are actually employed by BFI. A subcontracting firm, Leadpoint, employs the remaining 240 individuals. A Teamsters local filed a petition seeking to represent the Leadpoint employees, and named Leadpoint and BFI as "joint employers" in an effort to force both companies to the bargaining table if the union won the election. Want to know more about the impact of these joint employer decisions on your company? Of course you do! Register here for our webinar, "Labor Board Takes Aim at 'Joint Employers'" from 1 to 2:30 p.m. Eastern this Thursday, August 21. The local NLRB Regional Director (in Oakland, California) applied the well-established standard that the Board articulated 30 years ago in TLI, Inc., and Laerco Transportation. The Regional Director ruled that in determining whether a joint employment relationship exists, "the Board analyzes whether alleged joint employers share the ability to control or co-determine essential terms and conditions of employment." The essential terms and conditions of employment include "such matters as hiring, firing, discipline, supervision, and direction of employees[.]" Under this test, the joint employer must exercise direct and immediate control over employees. Applying this standard to the facts presented, the Regional Director found that BFI was not a joint employer with Leadpoint because it did not control the wages or benefits, and did not have authority to hire or fire, the Leadpoint employees; and because it provided only routine instructions rather than direct control. Moreover, the Regional Director noted that Leadpoint employees had their own Human Resources Department and that there was no direct evidence that BFI actually exerted direct and immediate control over the contracted individuals. The Teamsters appealed the Regional Director's decision to the Board, arguing that sufficient evidence existed to support a "joint employer" finding. In any event, the Union contended, the existing legal standard for determining a joint employment relationship should be changed because the current standard is contrary to the Act's goal of promoting collective bargaining. Demonstrating its willingness to abandon well-established precedent, the Board on May 13 officially invited the parties and interested amici to file briefs "to address the Board's joint employer standard, as raised in Browning-Ferris Industries." In particular, the Board asked for briefs outlining whether "the Board should adhere to its existing joint employer standard or adopt a new standard." Not surprisingly, the General Counsel promptly filed an amicus brief seeking a return to the standard as it existed before the TLI and Laerco decisions. • Or, where "industrial realities" require the finding of a joint employer relationship (that is, the nature of the commercial relationship between the parties effectively gives one party significant control over the terms and conditions of employment of the other party's employees). This position clearly broadens the standard and, if it becomes law, will undoubtedly result in more "joint employer" findings by the Board in temporary employee, franchise and outsourcing situations. In other words, two entirely legally separate entities will much more frequently be jointly responsible in unfair labor practice proceedings, representation elections and collective bargaining agreements involving their "joint" employees. The Board's position would also significantly expand the scope of union picketing against neutral employers during labor disputes because unions will now be able to claim that their targets are joint employers instead of neutrals. Of course, none of this will happen overnight. Right now, the General Counsel's statement regarding McDonald's is just an expression of intent, and the Board has not yet issued a decision in Browning-Ferris. But given the Board's many other pro-union initiatives (for example, "quickie" elections, micro-bargaining units, and the expansion of protected concerted activity), we are not encouraged that the Board will adopt a position that is not pro-union. A U.S. Circuit Court of Appeals might reject a Board position and continue a reasonable and effective standard, but it could take years before a case reaches that stage. Once the McDonald's, Browning-Ferris, and other joint employer cases move forward at the Board level, employers will at least be able to determine what to do in the shorter term to avoid a "joint employer" finding. 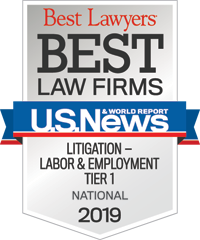 Constangy's Labor Relations Practice Group will continue to monitor this area and provide further analysis at each step. In the meantime, employers in vulnerable industries should evaluate their current employment relationships to assess risks associated with a possible "joint employer" finding.